12.I stumbled across this little beauty on topgear.com today. If you haven’t already checked it out, a quick video recap, Aston Martin shoehorned one of their 430hp V8’s from the Vantage into their now defunct Cygnet city cars that they had originally produced with the intention of not really selling any, but to keep their fleet’s C02 production below regulatory requirements. But! Somebody did buy one, and that somebody was influential enough to get Aston Martin themselves to do the dirty work. 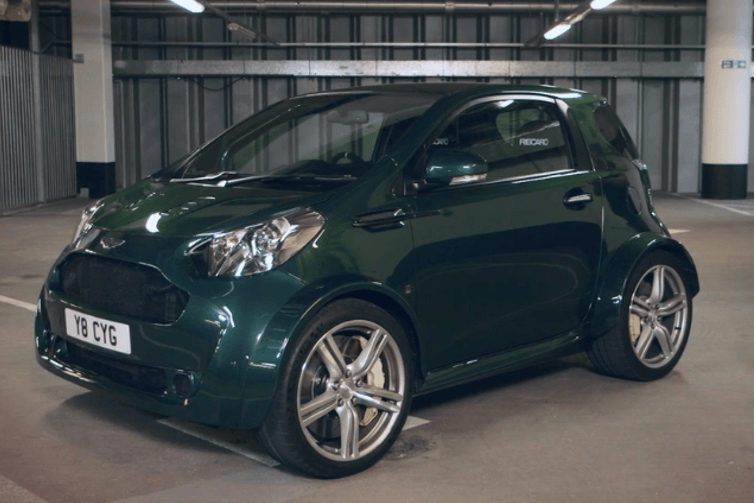 The result is an (unfortunately) one of a kind re-badged Toyota IQ with a 430hp monster lurking inside. The Vantage V8 is married to a 7 speed transmission, and although the Cygnet has put on some weight, 385kg (that’s 849lbs to our neighbors to the south. To put that in perspective that’s almost as much as your mom.) it’s still producing 313hp per ton, which is good enough for a 0-60 of 4.2s. Which, given the numbers coming out of Dodge’s camp with the Demon, or the speculated Tesla Roadster 2020 that sounds painfully slow, but you know what? That’s not really the point. The owner of this thing knows he’s not going to be the fastest at a track, or quickest off the line. That’s fine. It’s a city car, you’re never really going to be hitting it’s potential anyway. The point of cars like these is just the thrill of doing something a little bit crazy. Maybe even something a little bit stupid. There’s got to be nearly no better feeling than seeing people’s faces when the V8 roar comes out of the world’s shortest legal exhaust in the world’s ugliest Aston Martin. I absolutely love builds like this. My dream sleeper is a 1967 Mark 1 Mini Cooper, gut the interior to bring down the weight, drop it’s 1000cc inline 4 that produces about the same HP as a fart in the wind and swapping it out with the engine out of the Ducati Panigale. The Ducati throws out a solid 214hp and revs to the moon. Now I might have used some unfamiliar words there. A Ducati is a motorbike manufacturer. A Mo-Tor-Bike is like a car, but it only has two wheels and is vastly inferior in any and all situations and should be avoided at all costs. Back to the car though, for those of you not in the know, the Mark 1 was about the size of a child’s lunch box, however, with the increased weight of the Mini’s chassis, it’s going to be miles slower than the Ducati, hell, it probably won’t even be as fast as a Cadillac sedan, but that’s not the point at all. It’s riding in a car that people won’t even look at twice, that is, not until you rip by them on the highway with an engine screaming at 20,000rpm. It’s the spectacle, man. I love it.